It is the island in the sun, a place where the mountains meet the sea, home to heavenly beaches, majestic mountains and Europe’s greatest natural wonder, Mount Etna. Sicily’s coasts are gold with orange and lemon orchards; its northeastern Nebrodi Mountains are lushly forested; its central region is rugged land and rolling hills. The country is filled with vineyards, ancient olive groves, hardy almond orchards and endless wheat fields. Summer is amber land under a sky of blue. Winter finds palm trees dusted with snow in a surreal symphony. Spring is a rainbow of wild flowers set against greenest fields. The land of Trinacria (the ancient name for Sicily) tells many stories, of the culture of Hellenic antiquity, the glories of the Middle Ages and the wonders of the Renaissance. 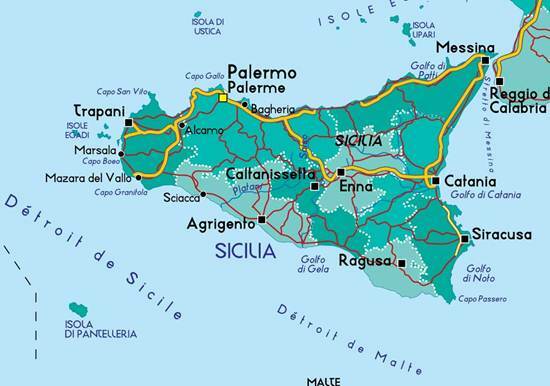 Sicily is shaped by a dozen civilizations, its traditions forged by peoples and faiths from the north and south, from the east and west. The island is Italian, but also French and Spanish and Greek and Arab, with some German nuances in its mix, beauty in diversity, Europe, Africa and Asia in one magical moment.